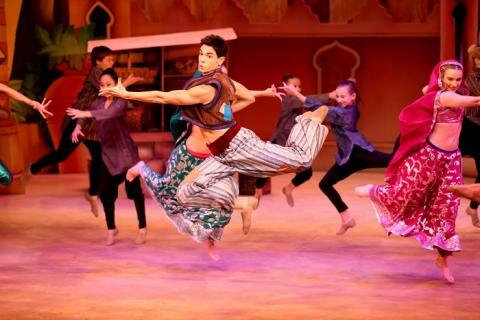 Start the holiday season with a trip to NC Theatre’s Aladdin and His Winter Wish. Learn what makes this show special and enter for a chance to win 4 tickets to opening night! The holiday season is here and I love celebrating the season with my family. One thing I love doing this time of year is heading to the NC Theater in Downtown Raleigh! Last month, my husband and I saw the incredible In the Heights and this month we’re excited to include our boys for an evening of fun seeing Aladdin and His Winter Wish! I received complimentary tickets to attend and promote this show. Synopsis: Based on the Aladdin fairy tale of a street rat with a dream, this special holiday-themed production follows the style of the traditional British Panto with singing, swinging and soaring adventure that features family-friendly magic, comedic twists, contemporary music, and more! British Panto or pantomime is a traditional style of entertainment that was originally developed in England. When I hear the word (or word part) mime, I think of white face paint and invisible walls. But this is so much more! The Panto style tells a story and gets the audience involved. I can’t wait to see how the performers use Panto in this production! 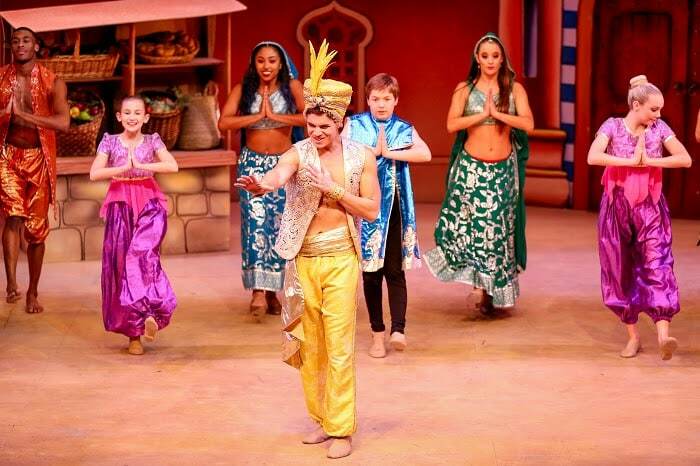 Aladdin and His Winter Wish runs from November 29-December 2, 2018 so there are plenty of options to enjoy this fun holiday show located at Raleigh Memorial Auditorium (2 East South Street Raleigh, NC 27601). Tickets start at $25 and you can save 20% on all seats/performances! Use code PRINCESS to save 20% now through 12/2/18 at 4:00PM. Look at available seats and buy your tickets from NC Theatre. If you’re hoping to get to Aladdin and His Winter Wish here in Raleigh, be sure to enter for a chance to win 4 tickets to opening night! One reader will be chosen from the comments to win 4 tickets to the 7:30pm, November 29, 2018 production of Aladdin and His Winter Wish! To enter, leave a comment on this blog post. One winner will be chosen and notified on Sunday, November 25th! Winner will need to respond within 24 hours to claim prize. Good luck! *This giveaway is for a Raleigh, NC show. Entries will be accepted through 11:59pmET, Saturday, November 24, 2018. One winner will be notified via email. Must be 18 or older to enter. Oh! I would love to win these. I think my kiddo and I would have such a great time at the show. Thanks for the chance to win! Hey Andrea! You’re the winner! Look for an email from me soon! Complete junk. Don’t waste your time. We got our money back. Aww I’m sorry to hear that! My family had a wonderful time! The kids loved interacting with the show.